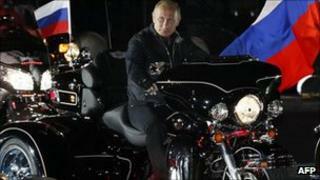 Russian Prime Minister Vladimir Putin has ridden into a bikers' rally on a Harley Davidson hours after a general election was called for December. He rode bareheaded into the southern city of Novorossiysk, flanked by other bikers, in what correspondents say was his latest macho political stunt. The motorcyclists were marking the anniversary of the city's liberation. Mr Putin gave a speech extolling the contribution Soviet motorcyclists made during World War II. During the wartime evacuation of Novorossiysk before the Nazi advance, they had brought children to safety, he said. His speech was attended both by bikers from the country's top club, the Night Wolves, and elderly war veterans. Hours earlier, President Dmitry Medvedev announced that the next general election would be held on 4 December. A presidential election will follow in early 2012 and there is much speculation that Mr Putin, a former two-term president, may stand again.